Gmail is a daily routine for many web users. With so many email messages sent and received – managing email overload can be a task. Gmail introduced Priority inbox feature sometime back to ease out email overload and allow quick viewing of emails that are important to you. Now Gmail has introduced more styles of inbox that allows you to see unread, important and starred emails first as against usually display of email messages in chronological order (date-wise). 1. 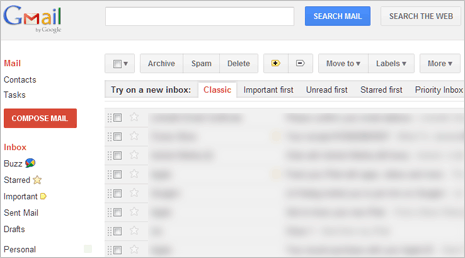 Login into Gmail account and you should notice new “Try on a new inbox” section at the top. If this section does not appear, just wait for few days. Gmail is rolling out this new feature in a phased manner to all users. 2. You should see tab buttons next to “Try on a new inbox” including: Classic, Important first, Unread first, Starred first and Priority Inbox. You can click through these tab button to view email messages arranged differently. Classic section is your default inbox layout. Messages are displayed in chronological order (most recent email message at the top and so on). Priority Inbox arranges messages which are important and unread at the top. These are followed by starred messages and then other messages. Important First put important email messages based on activity of important arrow markers next to each email messages. It list both read and unread yet important emails at top. Unread First list all unread emails based on the date of receipt at the top. Starred first list all starred messages (with star) at the top and other email messages below it. This is a very subjective thing to decide. For example: if you receive lot of emails on daily basis, then using Unread first is best inbox style to stay updated with latest email messages in your inbox. However, if you love to arrange and organize email messages using stars and important arrow buttons, then either of Important First and Starred First is good option for Gmail inbox style. If you are already using Priority Inbox style and love they way it organizing your email messages, then stick with Prority Inbox style. If you do like to change (like many of us) and use email occasionally – then Classic default layout style is best option.